Rouge (Calgary) – Pretty food | I'm hungry, let's get some food! 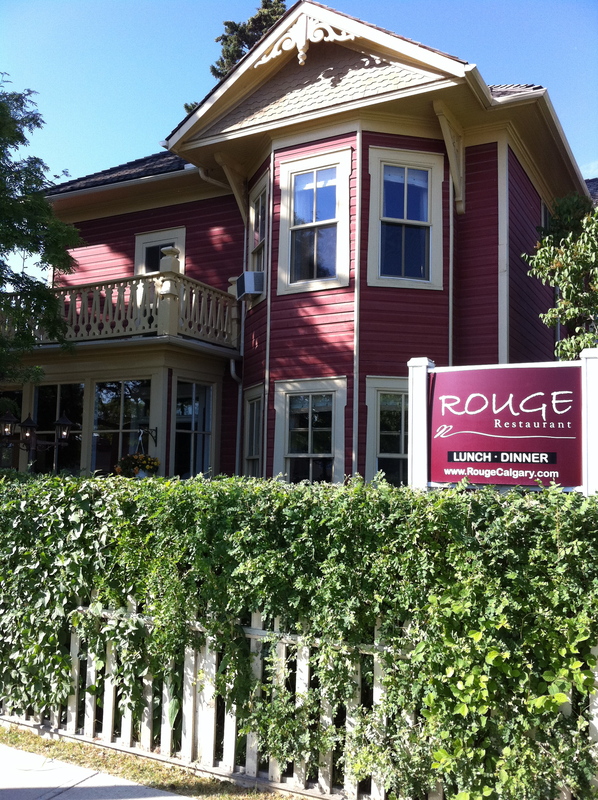 On a recent trip back home to Calgary my parent’s took me to Rouge, an Inglewood home converted into a French fine dining establishment. On the way into the restaurant I found this particular sign quite amusing. I assume this was referring to the wines. 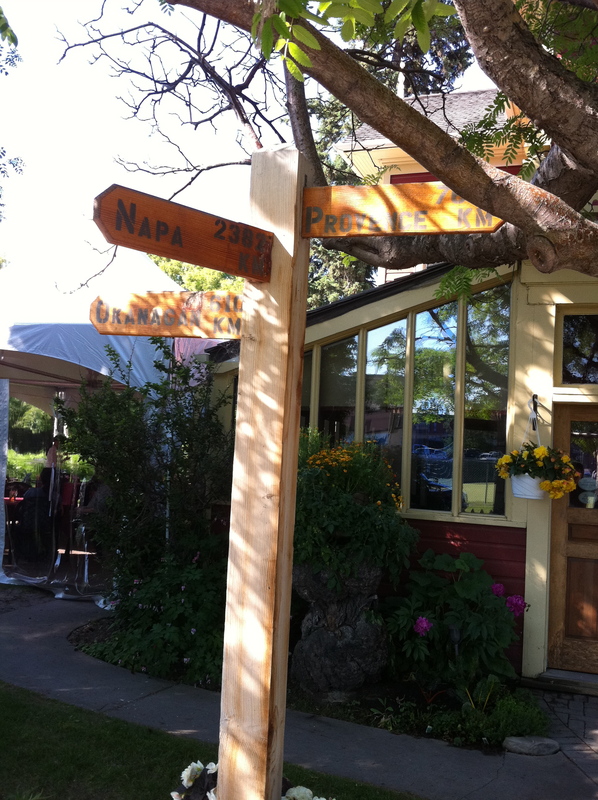 Oddly enough probably three of my favorite wine regions. We ordered the chef’s menu and were excited to see what the chef was about to put together. 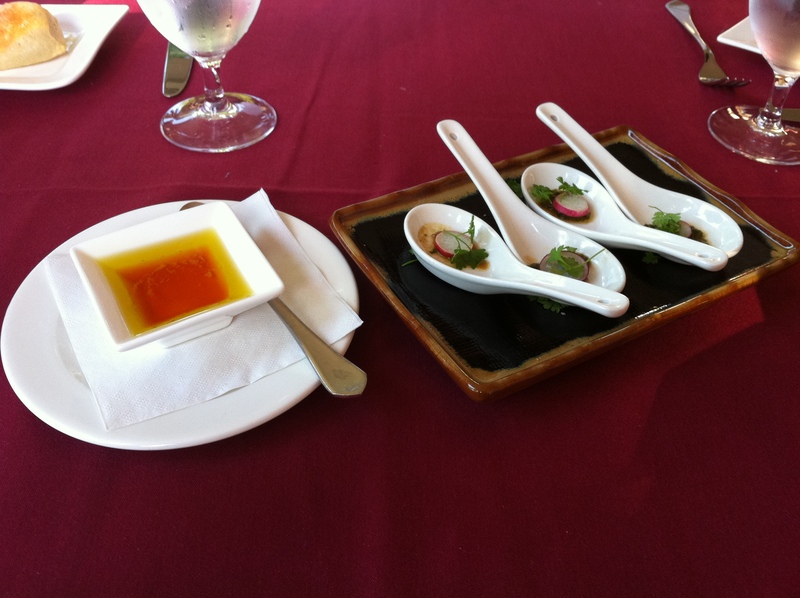 The amouse-bouche was a radish from the restaurant garden mixed with various oil and herbs. The bread, freshly baked, came with a berry vinaigrette in oil. 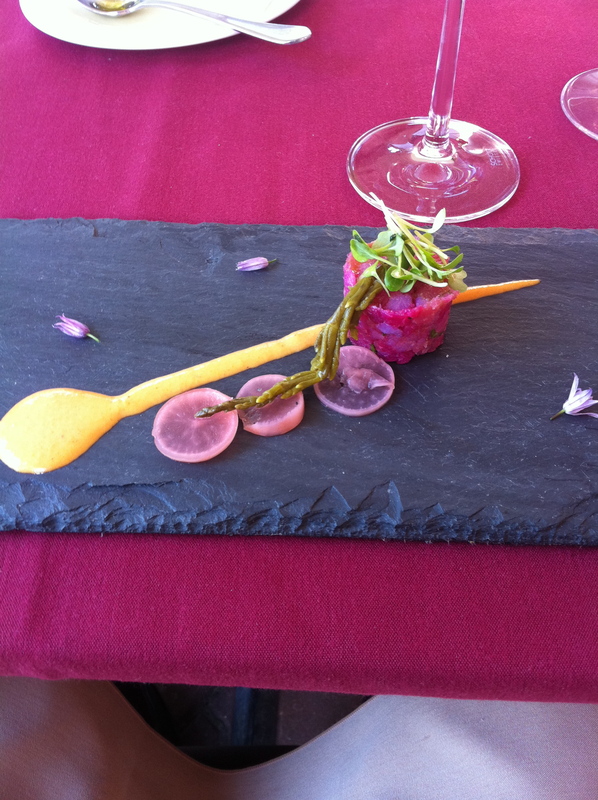 Next was a halibut tartar with asparagus, greens and a pepper sauce. The fish was fresh was a lovely taste and texture. The pepper sauce was a great compliment and added a nice zing to the softer tasting fish. 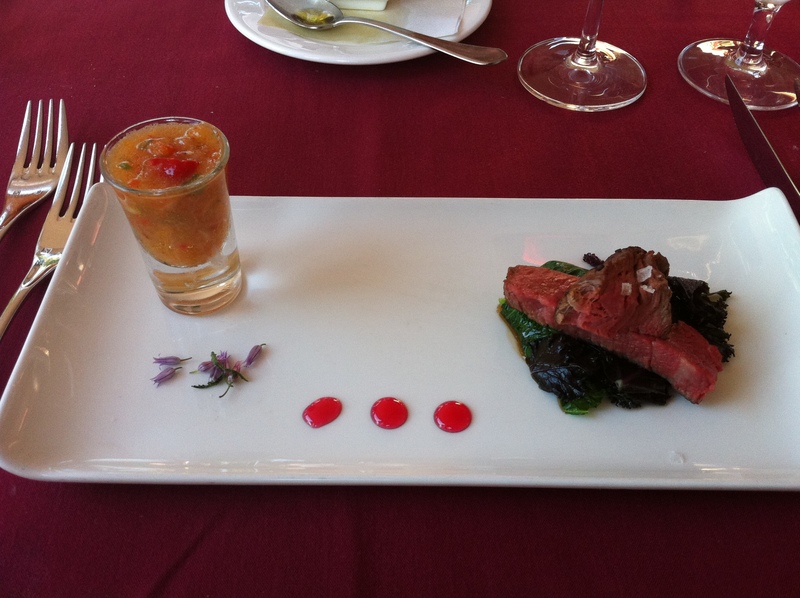 Next was the gazpacho, dots of a berry coulee and steak. Now it wouldn’t be an Alberta chef’s tasting without beef. The gazpacho was hearty and delicious. I always find cold soups a little strange but this one was full of flavor. I wouldn’t even say it was refreshing (which most cold soups are). It was more rich and textured than one would expect. The steak was good. Tender, cooked perfectly and had a nice hint of truffle since it was topped with small shavings. 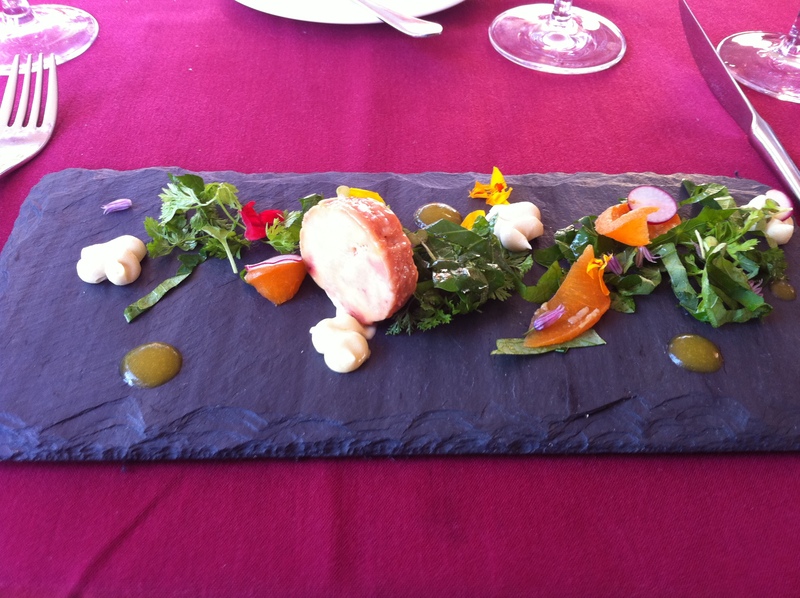 Next was the foie gras over mixed greens and citrus. The foie gras was oh so creamy and oh so rich! It was balanced out nicely with the fresh greens and citrus flavors. This dish was a home run for me. 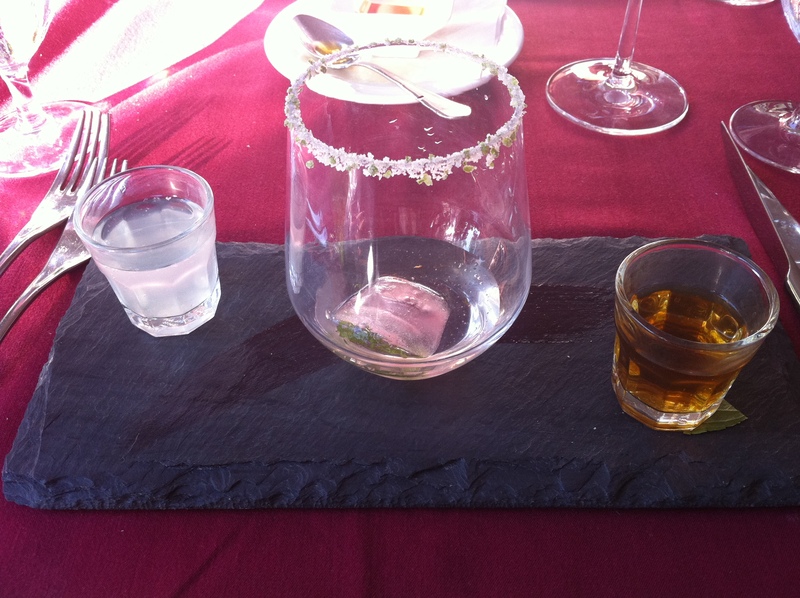 Next was a palette cleanser with a sweet beverage, cold mint water and hot tea. Well timed to clear the rich taste of the foie gras. The beverage, when mixed together was very interesting. Soothing from the hot tea, but refreshing from the mint and subtle sweetness. 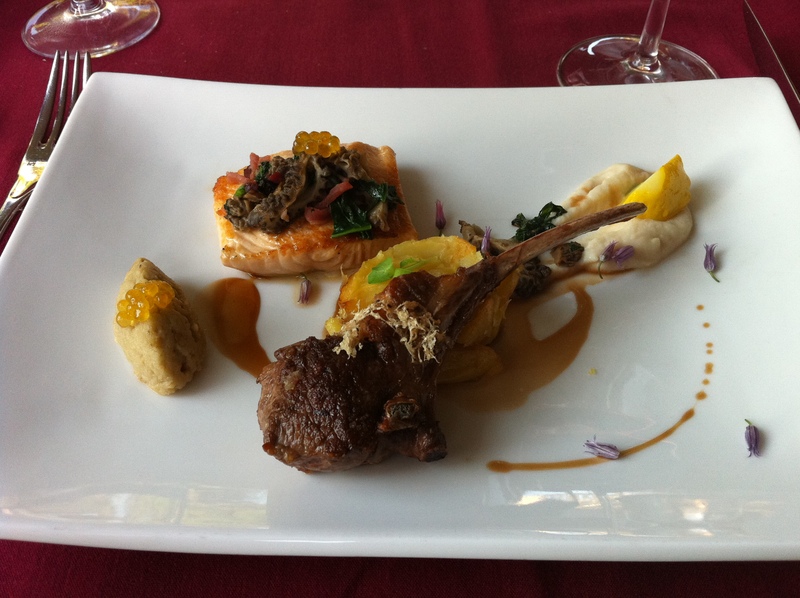 Next was the arctic char, rack of lamb with shaved truffles. It can served with an eggplant puree and cauliflour puree. The fish was well cooked but a little on the heavy side for my liking. The lamb was awesome. Tender and flavorful (not gamey) but I just wish we had more. The purees were delightful and complimented the meats really well. I’ve been having a few hit and miss experiences lately with eggplant but this one was a hit. The cheese course. 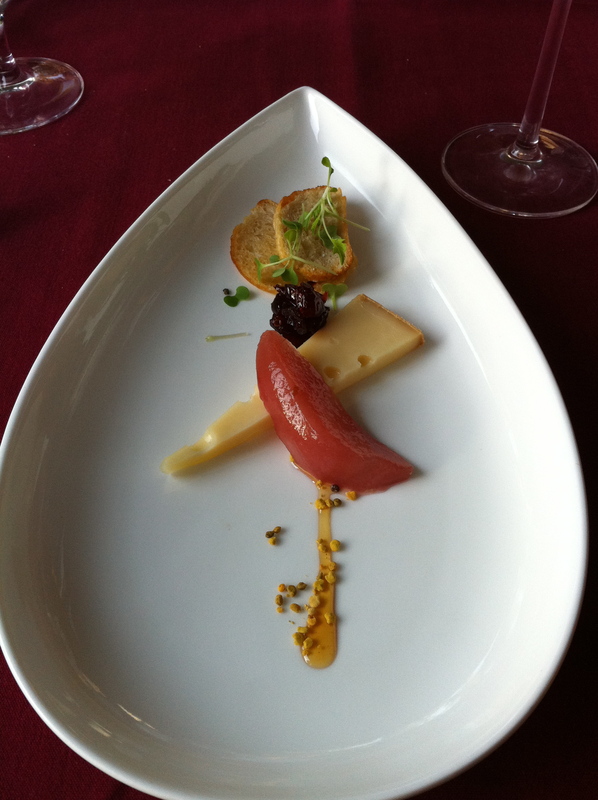 It’s a Quebec cheese with a blood orange, berry, honey sprinkled with bee pollen. All I can say is that this was amazing! Bee pollen?! Who would have thought the crunchiness would add whole layer of complexity of this dish. Also, blood orange and cheese, match made in heaven. The dessert was a thick crunchy layered pastry with fruit and ice cream. Sweetness balanced by creaminess of the ice cream. The pastry was a little on the heavy side but it was very tasty and buttery. 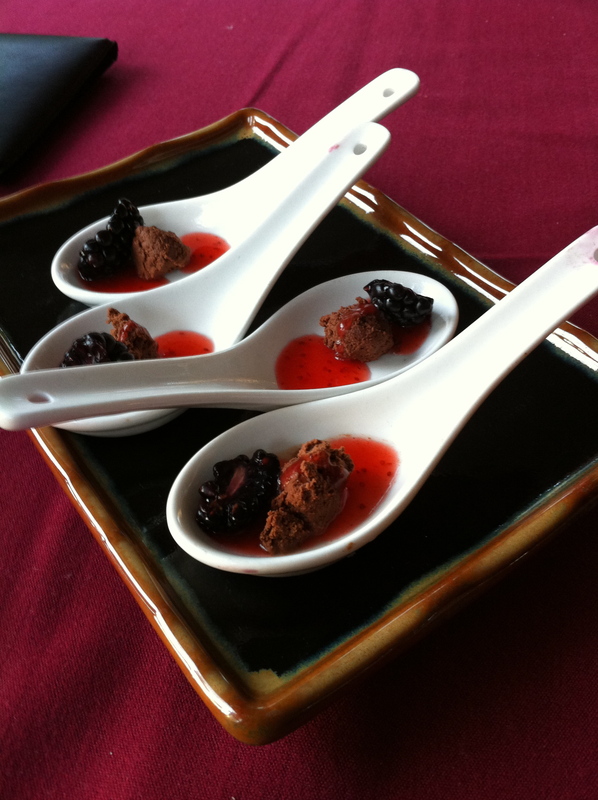 To finish they gave us an additional treat, chocolate mouse with a blackberry on top of the berry coulee. This sounds much sweeter than it actually is. The chocolate is rich dark chocolate so it’s more cocoa-ey than sweet which is good since the coulee is quite sweet. The berries add a nice freshness to the bite which leaves you leaving the meal smiling and satisfied. The service at this place is pretty amazing. Very attentive and friendly and the staff wanted to make sure we were enjoying ourselves. The food is very well executed. It’s not the most adventurous restaurant but they do add some subtle twists to some dishes that makes things interesting. 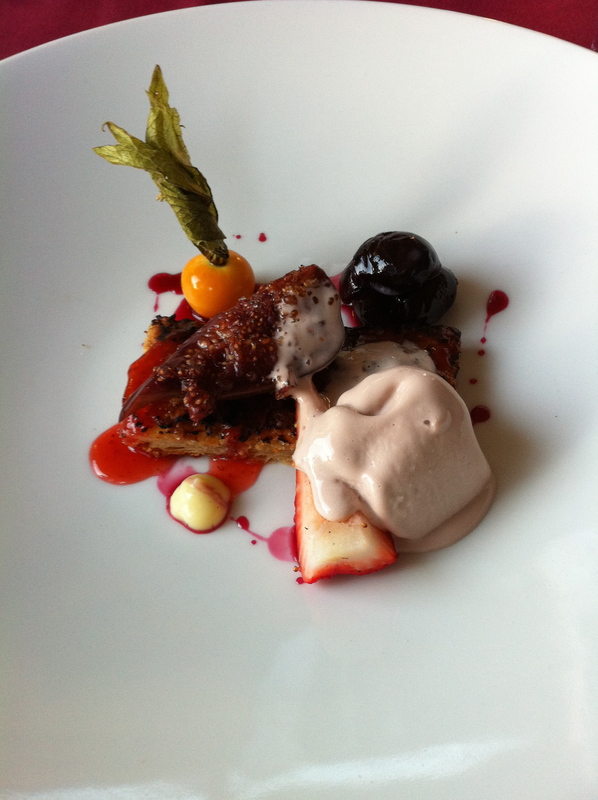 And the plating….one of the best I’ve ever experienced. These really are picturesque dishes. ~ by jlowjlow on August 7, 2011. This entry was posted on August 7, 2011 at 1:51 pm and is filed under Calgary, Cheese, Dessert, Fine Dining, Fish, French, Seafood, Steak.You can follow any responses to this entry through the RSS 2.0 feed.You can leave a response, or trackback from your own site. Previous: Le Cartet (Montreal) – Brunch? Oui s’il vous plait!